The Winsford Industrial Estate success story continues, with the expansion of the fully-occupied site. Cheshire West and Chester Council and partners will invest £5million to kick start development on council-owned land adjacent to the existing industrial park. In addition to its own £1.2m investment, the Council, working alongside the Local Enterprise Partnership and its Limited Liability Partner, PSP, has been able to attract a further £3.8m investment from the Local Growth Fund and release the new employment land in the town. This funding will allow the industrial estate to continue to grow into an even better place to do business. Phase 1 of the scheme is to develop 17 acres of land which Tiger Trailers will use to expand its thriving base on the estate. The council has recently agreed the sale of land to Tiger Trailers who will commence building operations this May. Tiger Trailers is a privately owned, family business which makes commercial vehicle bodies and trailers. It is rapidly growing into one of the UK’s leading manufacturers. Lisa Harris, the Council’s director of Place Strategy, said: “The Council and PSP have been instrumental in facilitating this deal, which will attract considerable new investment from businesses and developers in Winsford and provide more skilled jobs for local people. 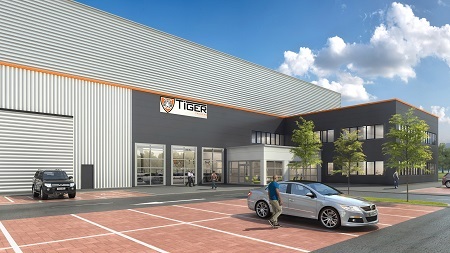 “This first successful agreement with Tiger Trailers to support their growing local business will see a 125,000 square foot manufacturing facility being delivered by December this year. Phase 2 of the scheme could result in Winsford Industrial Estate having the potential to unlock 625,000 square feet of new commercial floorspace, creating 1,500 new jobs. This has an investment value of £180m. Early market testing has revealed there is significant interest from a number of parties which are considering moving to the estate.